Richard and Kate have lost everything: Job, home, lifestyle. Now, with everything they own packed into their battered old station wagon, they’re just trying to make it to Cleveland, where Richard’s brother has offered a chance to start over. But making the journey is easier said than done, and when Richard’s plans to borrow money from an old friend fall through, they are left with no choice but to seek out an old flame of Kate’s for help. But will this truly be a chance to move on, or the catalyst for a larger life change? Following on 2007’s experience working with a seasoned author, Tohubohu recruited novelist Barry Lyga to pen 2008’s entry in the 48 Hour Film Project, once again produced by Pam W. Coughlan and directed by William R. Coughlan. 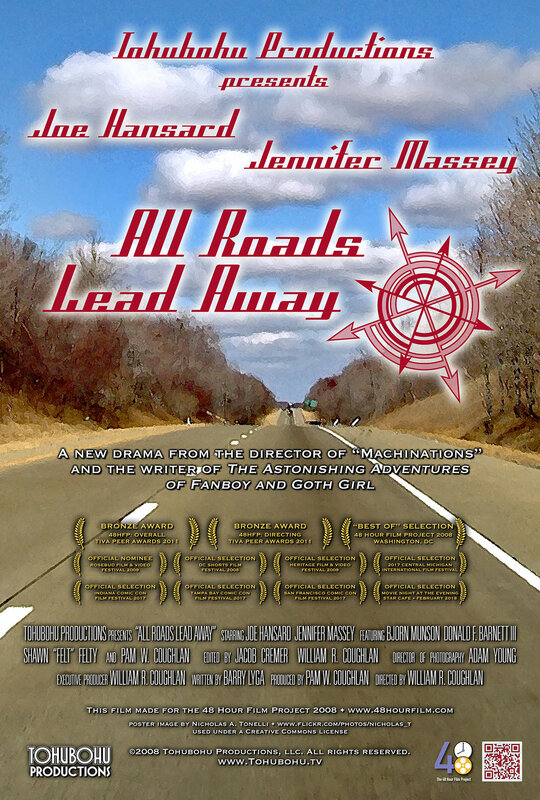 Produced entirely from May 2nd through the 4th, “All Roads Lead Away” was Tohubohu’s sixth entry in the competition, and premiered at the AFI Silver Theatre on Friday, May 9th. One sheet poster image by Nicholas A. Tonelli, used under a Creative Commons license.